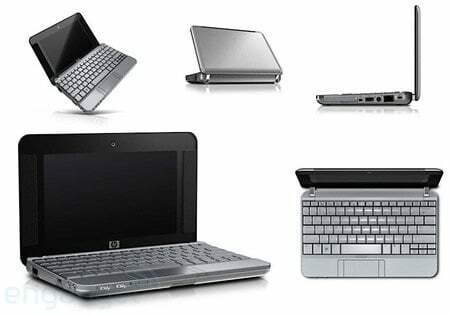 HP's going after the Eee PC with a compact laptop that sports an 8.9in display and more connectivity options than the elfin Asus machine currently offers. So says Engadget, which has posted some pics and a very basic spec. The Compaq 2133 looks like a cross between the Eee and Apple's old 12in PowerBook G4. The 8.9in screen has a resolution of 1366 x 768, and judging by the pics the machine offers a two USB ports, Gigabit Ethernet and what looks like a four-pin Firewire port. There's an ExpressCard slot too and a webcam above the display. It has Wi-Fi and Bluetooth. It weighs from 1.13kg. The 2133 is down as running a choice of Linux or Windows Vista. Alas, the story doesn't provide any indication of what's under the hood, but the next generation of Intel's Ultra Mobile Plaform, codenamed 'Menlow', seems the most likely candidate. And there's the now obligatory solid-state disk option for those with the cash, and a regular hard drive for those without. Today, it emerged UK PC maker Elonex is preparing a sub-£100 Linux laptop for schools.